Our clients love us! See what they have to say about A Plus Pet Sitting, the Priemer Pet Sitting and Dog Walking Service Provider in Madison WI. If you are looking for the best pet sitter or dog walker in Madison Wisconsin, look no further. Give us a call or shoot us a text at (608) 228-1350 today! Or head on over to our contact form to shoot us an email. Whenever I used to leave my dog Oreo. I would be concerned if someone would pay attention to him, feed his raw diet food and wonder if he was in safe hands. I leave him with Jeanne now and I know he is always in good hands. He is always happy to see her so I know she treats him the way I would. She takes great care of him and I would definitely recommend her service to anyone! We don’t like it when Dad is gone but we’re so happy dad found Jeanne and A+ Pet Sitting and Dog Walking. Jeanne doesn’t take us walking but she walks with us in the yard. We pee pretty quickly but we take our sweet time to go poo. Jeanne is very patient and lets us take our time. She pets us and we really like that. We really appreciate Jeanne and what she does for us and dad. Woof. Thanks Jeanne! I really appreciate the professionalism and quality of Jeanne and A+ Pet Sitting and Dog Walking. I’m regularly out of town on the weekends and Jeanne is always there for me. I trust Jessie and Sydney with Jeanne and I don’t have to worry about my old girls while I’m away. I know they are in safe hands. If you need a quality pet sitter or dog walker I definitely recommend Jeanne and A+ Pet Sitting and Dog Walking. We have depended on Jeanne and A Plus Pet Sitting and Dog Walking to look after our pets for several years now. 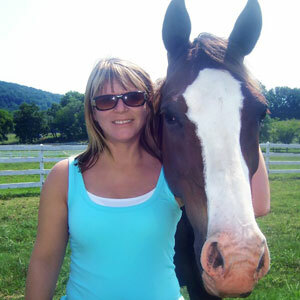 Jeanne is reliable and attentive to our instructions as well the needs of the animals. She has taught us things we didn’t know about our pets and even offered helpful advice on training and feeding. We and the dogs love her–and probably the cats too, but who can tell? I have a wonderful dog walker, she has come through snow and rain and sunshine for years. Her attention to my dogs lets me know that she cares for them individually. If she feels that something is wrong (or right) with of them, she alerts me. Dependable, observant and straight with me, that is Jeanne. I am so lucky to have found her. She even brushes their teeth, what more can I say! I highly recommend A Plus Pet Sitting and Dog Walking. Jeanne has walked and assisted my two dogs for over three years. My dogs love her care and attention. She is a great resource for my pets and I would highly recommend her. I don’t know what we’d do without Jeanne and A Plus Pet Sitting and Dog Walking! We have two dogs, one is very particular about who he will trust. He wouldn’t go outside for one pet sitter we tried, but he is very comfortable with Jeanne. I think it is her calm personality. I highly recommend A Plus Pet Sitting and Dog Walking, so much that I recommend them to clients at the veterinary clinic I work at. Jeanne Cairns, the owner, is so great with my cats. She has been our go to when we go out of town and need someone to pet sit for us. She will come and spend time with them, make sure they are well fed and generally ease our minds so that we can focus on whatever we need to be focusing on. When my cat Baby was sick, Jeanne helped take care of her when we needed someone to come and give her her medication during the day. Jeanne and A Plus Pet Sitting and Dog Walking are so wonderful. If you are looking for someone you can trust to take care of your furry babies, be it pet sitting, dog walking or even making sure they get their medication, Jeanne and A Plus Pet Sitting and Dog Walking are the ones I would highly recommend. Jeanne has been our pet-sitter for many years, coming to the house to feed and care for our cat. She is very reliable, and takes notice of any needs that come up during our absence from home. I highly recommend her to care for your pet’s needs. A plus pet sitting is great for when you go away on vacation or need a babysitter for your furbabies and don’t want to stress all your pets out by boarding them. We have two cats and two dogs and and there is only a small fee for an extra dog and a few cats are free. Our pets have special dietary needs so that is great for them to keep to the same food schedule and have the space of their own home to roam. The dogs get let out in their own yard and the pet sitters keep our yard clean and play with the pets. We have even been surprised with new pet toys for them when we get back from vacation. We worry a lot less about the pets because we have someone come over and take care of all of them 4 times a day for an affordable price. When we boarded the dogs they would get stressed out and the cats can’t do that. Plus they will water your plants, take in mail, and switch which lights are on when you are away for several days. We also know that our house is being watched daily when we are away and if the animals gets sick they will be taken to the vet. I would highly recommend them! Jeanne is amazing with my fur children. She gives them an abundance of love and attention. She is always sending me updates and photos of the wonderful time they are having. I would not trust my animals to anyone else. My dogs genuinely love her and she is amazing with them. Jeanne and the folks at A+ Pet Sitting & Dog Walking are the best. We rely on them whenever we need our three cats watched when we’re out of town. One of our cats, especially, is a bit needy. When we had friends cat sit, she used to act out by knocking things over, scratching stuff, and generally making a fuss! That never happens when we have Jeanne & co. watch them. Knowing that we’re going to come home to happy cats (and intact decorations!) is great for our peace of mind. Jeanne has always scrupulously followed our instructions about medication, etc., and when we email her with questions while we’re out of town, she always gets right back to us. It’s great knowing that our cats are in such good hands. I am the founder of All Creatures Rescue & Sanctuary, and have a large herd of rescued guinea pigs, rabbits, and parrots. I have been using Jeanne for almost 4 years to petsit for my little guys, and finding her was a godsend. Prior to Jeanne, I almost never left home for more than a night – for nearly 10 years! Now I can take actual vacations, knowing Jeanne can handle everything. From the start, reading about her experience with horses, I felt comfortable that Jeanne would understand the sensitive digestive needs of my guinea pigs and rabbits. I was very impressed with her professionalism and detail-oriented nature at our first meeting, as well as with her genuine care and interest in the animals. I have a number of very elderly animals with special needs – they require daily medications, special foods, etc – and I have always felt perfectly safe leaving these animals in Jeanne’s hands. She knows exactly what to look for in terms of calling to alert me to changes in their health. More recently, I adopted a pair of elderly greyhounds and Jeanne was my first choice for mid-day walks when I couldn’t be home in time for them. 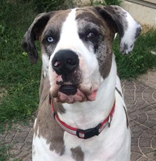 She has a lot of experience with greys and knows all about all their special doggie quirks! I also have proof-positive that my animals like Jeanne – my parrot, who is fearful of all strangers, learned to mimic her “Hello” after only the first few visits! Knowing that he’s this comfortable with her is hugely reassuring to me. I would recommend Jeanne to anyone who has small pocket pets, birds, or greyhounds, and I am delighted to offer this positive recommendation of her services and expertise. When my built-in pet sitters graduated from college and moved out of state, I was very fortunate to find Jeanne and A+ Pet Sitting to care for Fleece and Juneau. My husband and I travel frequently for work and for pleasure so it finding a someone dependable, trustworthy and affordable was extremely important to me. Jeanne takes great care of Fleece and Juneau when we’re away. She makes sure that Fleece and Juneau have food, water, medicines, and some play each time she visits. I couldn’t be more satisfied and highly recommend Jeanne and A+ Pet Sitting. A + Pet Sitting has been an amazing addition to our busy life. We have two rambunctious and loving dogs that love to spend time with my husband and I every day. Our work schedules changed this summer and we were needed more frequently during the week. We were concerned for our two dogs because we were able to be at home with them before summer had started. It was such a relief to find A + Pet Sitting this summer to check in on the dogs while we were away at work. Jeanne has been so kind and flexible with our work schedules. She has been understanding when we had to change a date last minute or request her to check in on the dogs over a weekend day. 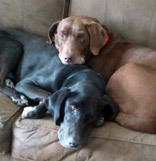 One day our older pooch was not feeling well and Jeanne was able to check in on him earlier on in the day. She has truly been a life saver on multiple occasions! She is continually communicating via email, text and leaving notes at home to keep us updated. This has really given us peace of mind when we are away at work. And the best part of it is, when we return home from work at the end of the day the dogs are more relaxed and happy. Thank you A + Pet Sitting for everything!!! We are very pleased with your services and we will continue to stay happy customers for a long time. We highly recommend A+ Pet Sitting to anyone who is looking for a loving friend to take care of your furry members when you are away! Jeanne is very reliable and goes out of her way to take care of all of the specific details on our list. She has managed to make friends with our very cautious “scaredy-cat” Pooters, and even took great care of our Sea Monkeys! My husband and I used to have friends take care of our two cats when we were traveling, but one time when our friends weren’t available, we decided to try Jeanne. Since then, we use her every time we need a kitty sitter! I love that in addition to making sure that all of their basic needs are met, she will spend the rest of her visit playing with the cats or doing whatever they like to do. It’s also great that she will send email updates so I don’t need to worry about them when we’re gone. I’ve recommended Jeanne to one of my friends, and she was happy with how Jeanne took care of her cats too. I plan to continue recommending Jeanne to anyone I know who is in need of a pet sitter! Jeanne is great! She is very reliable and takes such good care of Parker. We have peace of mind when we are away knowing that we can trust Jeanne in our home and with Parker. We love reading her notes about her visits. We would definitely recommend A+ Pet Sitting and Dog Walking!!!! I am very pleased with Jeanne and A+ Pet Sitting Service. Jeanne is very reliable and trustworthy and she takes such great care of our puppy. Often times, we will need someone on the weekends to accommodate our busy sport schedules. It gives me great piece of mind to know that our puppy is cared for when we are away for long hours and I don’t have to worry about our puppy while we are away. Jeanne is very flexible whenever we have schedule changes too. She has been very helpful with all of our “new puppy” questions and offers us advise and suggestions. I would highly recommend A+ Pet Sitting service to anyone. 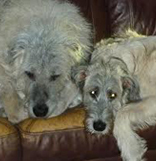 Jeanne has taken excellent care of Mathew and Rafe, two large (150 pounds and 210 pounds) Irish Wolfhounds which is not always easy due to their size and gentle yet stubborn personalities. Jeanne takes good care of them but she really knows them and watches their behavior and lets me know if anything changes. This is especially important as they get older and we need to address any ailments right away. There are very few people I trust with my dogs and Jeanne is one of the few I do trust. Jeanne is the best! Our cat, Schrodinger, loves it when she visits and is always incredibly content and happy whenever we come home from a trip. I cannot recommend her enough for your pet sitting needs. Jeanne leaves great notes filling you in on what happens with your pet during her visits and always double checks that you’ve made it back when you said you would return. She also has left the little guy treats and toys on occasion, which he (and we) greatly appreciate. I feel very confident that Schrodinger is in good hands whenever we’re away! WONDERFUL! Jeanne is a professional through and through. She has done a wonderful job with each of my dogs and takes care to keep me informed after each visit. My “babies” love her!! I don’t know what I would do without the wonderful companionship A Plus Pet Sitting has provided for my animals from my horses, dog and kitties. She has been my pet sitter for going on ten years and I can’t imagine having anyone else. I knew the minute that I watched her interact with my animals that she was the one to care for them. She cares for each and everyone of them like she does her own. I highly recommend her to anyone who wants an absolutely amazing pet sitter and just a caring individual. She will go the extra mile for you and your pets. Jeanne walks Howie and Shannon daily during the work week and takes care of them while we are out of town. She also does things like bring in packages so they aren’t sitting outside, moves the garbage bin if it fell over on trash day, and let us know the time we left the front door unlocked… We always know that they are in good hands, and she also keeps an eye out for any behavior changes or things that might indicate an injury or illness. Highly recommended… and I’m positive Howie and Shannon would say the same! A+ Petsitting and Jeanne have been caring for our cat, Snowball, for several years. Snowball is one happy cat when Jeanne comes to care for her. 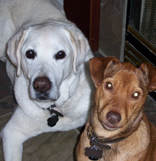 We highly recommend A+ Petsitting to anyone looking for in home pet care. For the first time ever, I have found a pet sitter I can trust. When I leave town, I can trust that Jeanne and her team will be there for my cats. I can tell they’ve been well taken care of, because they are calm and happy when I return. Jeanne has been there for me at the last minute several times during the few years I have known about her service, and that has made my life so much simpler. I cannot recommend her service highly enough! Jeanne is fantastic! She is extremely conscientious – always on time and always reliable. Our dogs love her so much, they get very excited when she is coming over. But perhaps most of all we are grateful that Jeanne has been able to teach our dogs better manners. We don’t know how she does it, but after a few months of walks with Jeanne they are more respectful, and respond better to commands. 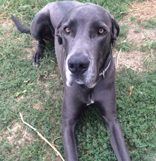 With Jeanne and A+ Pet Sitting we feel that we have another member of the family to rely on to take care of our pups. I have used Jeanne and A Plus Pet Care since leaving home in October. I live in MX during the winter and there’s not always someone available to look after Keeda, our 4 year old kitty who demands plenty of attention and lots of affection. Jeanne has been wonderful, and has willingly added other tasks to her to do list when she visits, including bringing in mail and watering plants. Scheduling has been confusing because my daughter doesn’t always know when she will be home, and Jeanne’s been very accommodating about working around the confusion. It’s nice to know I can trust that Keeda is well taken care of, so there’s one less thing to worry about during my travels. Our experience with A+ Pet Sitting has been wonderful. We count on Jeanne whenever we take any length of trip, from a long weekend to a week away. It is such a relief to know that Jeanne is there taking care of our four cats and watching our house while we are away. Jeanne is by far the best cat sitter we have ever had. Jeanne takes the time to play with them and has even brought them new toys to play with. We always find a note upon our return with a summary of how things went and she even comments on each of their unique personalities. Once Jeanne started watching our cats we noticed a significant difference in them when we returned from a vacation. With other sitters, when we returned home, our cats were all over us acting starved for attention. When Jeanne began watching our cats that behavior ended – our cats greet us and act as if it were no big deal that we were gone for so long. We would highly recommend Jeanne from A+ Pet Sitting. My family has a 15 year old miniature poodle named Snuggles. Jeanne takes wonderful care of my “grandpa” dog. Snuggles has trouble getting up and down, some days walking is too hard. Jeanne cares for him as though he is her own dog. She always puts Snuggles needs first. She is attentive and responsive to his ups and downs. She communicates during the week her observations and concerns. It is great to have an extra set of eyes on my aging dog. I know he is in great hands! We have always considered ourselves lucky to have found a caring and trusting dog walker. Thank you so much for doing what you do. We thought we had everything planned out for our new puppy. Our work schedules changed and we needed someone to fill in for us over the lunch hour. I found A+ Pet Sitting online and gave a call. From the first time we talked, Jeanne was professional and honest. After our mini interview my wife said that is who we are going with. Seven months later and we couldn’t be happier with our choice. Through everything that puppies go through, she has helped us get through them. Jeanne is great to work with. She is accommodating to our schedule when things pop up, leaves great notes about how the day went, and cares for Addie (our English Springer Spaniel) as if she was her own. Addie loves the extra play time and we love the peace of mind. We would not hesitate to recommend her to anyone. Jeanne has been an invaluable resource for our family when we take trips–short or long. She cares for our Soft Coated Wheaten Terrier like he was her very own, knows his temperament and quirks well (he has many), walks and spends time with him, and is centered on his needs. Sometimes we take very long trips–2 weeks or so–and in addition to watching our beloved pet she also waters plants, sees that the house is secure, brings in mail, takes out garbage, and even mails bills that we need sent on a certain date. Jeanne is a treasure and we are so pleased to have found someone with her knowledge of pets, her can-do and positive attitude, and sterling character. We consider her a trusted member of our extended family and highly recommend her. Jeanne is a life-saver. Truly. My husband and I travel either alone or with our kids at least two times a month. We rely on Jeanne to care for our two dogs, Sunny and Roni, during all of our trips. She has been caring for them for almost two years and in that time she has performed some heroic acts. First, one winter we boarded the dogs at a kennel so we could have our floors re-sanded. The dogs caught kennel cough while at the kennel and Jeanne, on a moment’s notice a day or two before New Years’ Eve, collected the dogs from the kennel, coordinated with the vet and us to give them their medications, and brought them home and cared for them in our house until we returned. Another time a few months ago a friend had entered our home to retrieve at item to mail to us on one of our trips and couldn’t find one of our dogs and called to say he was missing. We called Jeanne and in a heartbeat she was over at our house, found our dog (he had been hiding in the bedroom), and communicated with us right away to reassure us he was safe. Countless times I have called Jeanne to come ASAP because I had to attend a field trip with one of my kids, or I had a last-minute work commitment and needed her to take them out, or I was alone with the kids for several days while my husband was away on business and I just needed a helping hand with the dogs. Our dogs are 10 years apart and Jeanne has to be sensitive to the physical needs of a geriatric 12-year-old lab and a hyper 2-year-old mutt. She has earned their trust as well as ours. Our neighbors and dog-park friends have commented on how in-tune Jeanne is with them and she even manages to photograph them during walks. Her pet portraits are all over our walls. 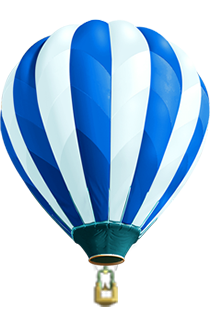 I have recommended Jeanne to a number of clients who have since hired her and written testimonials for her. I know that in writing this I risk having to share her with more clients. But because I am a dog-lover, I feel all dogs should be privileged enough to have Jeanne as their care-taker. And all humans should enjoy the liberty and reassurance that comes with giving Jeanne a key to your house and feeling the freedom to live your life to the fullest because your pets are in the best of hands. You will never need to ask yourselves: “What about the dogs?” Just call Jeanne. Right now! My husband and I travel frequently and have found Jeanne and A+ Pet Sitting to be consistently reliable, going over and above what is required to ensure that our pets are getting the best possible care when we are away. From small things like bringing them a little toy or snack and leaving a note to tell us how things went, to big things like dealing with medications and unexpected travel delays, we have been consistently impressed with the attention that we receive. We recently decided to bring a dog into our family of three cats, and it is hard to express how appreciative we are for the tremendous support that Jeanne has given us as first-time dog owners. 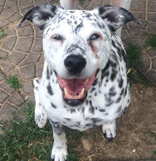 From helping us with our search for a rescue dog, to providing insight and suggestions on how to deal with behavioral issues and also always being available when we needed her – including a long twelve-day stretch when we were out of the country – Jeanne has been much more than just a pet sitter. We couldn’ t do it without her, and would highly recommend A+ Pet Sitting to anyone who loves their “kids” as much as we do – you will not be disappointed! When my husband and I planned our honeymoon I was so worried about who would care for our cats for 10 days while we were away. I researched and interviewed and called references for several pet sitters. I had a gut feeling that Jeanne was my best option. When she came to our home to meet our kitties, she shared a story of an asthmatic cat she once had who was accidently locked in a closet by her pet sitter while Jeanne was away. This really hit home since one of our cats, Besa, has asthma and needs medication daily. One of the other big sellers was when our cat Jonas – who doesn’t like anybody – came right up to Jeanne and rubbed on her! I tend to be one of those people who puts a lot of faith in an animal’s perception of someone and Jonas had obviously given his stamp of approval. As a result, we jokingly refer to Jeanne as Jonas’s girlfriend! Jonas also has had some health issues and is on daily medication. Whenever we leave our cats in Jeanne’s care, we are 110% confident that they will be very well cared for. Jeanne has taken the time to get to know the personality of each cat and has even called us on vacation with any concerns if one seems “off”. We always know that they are being fed, watered, taking their medication and getting played with and cuddled when we’re away. She always leaves a note for us to let us know how everybody was, and even toys or goodies for the kitties. I would highly recommend Jeanne and A+ Pet Sitting to anyone who wants to know that their animals will be cared for and loved while they are away. Over the past six months, Jeanne has taken amazing care of my rats. Normally, you might not think this is such a big deal, rats are pretty low-maintenance, but mine have special needs. They both have serious respiratory conditions that mean they need medications twice a day, at specific times, in specific doses. Jeanne has been just great about dealing with the pages and pages of instructions and details I leave her every time I go away. I know that, when I leave them with her, they are going to get care just as good as I would give them if I were home. Not only that, but I know Jeanne loves my boys very much. Every time I come home from a trip, I find another treat or toy she’s bought for them. And they love her, too! They’re always much happier when she takes care of them than when anyone else does. I definitely recommend Jeanne to anyone, even those who have sick or difficult pets. She will care for them as if they were her own. Jeanne has been an incredible friend to our tiny chihuahuas. When needed, she’s come over to let them out several times a day and has fed them on schedule. One time, one of our babies had to take medicine, and at the tail end of her treatment we had to leave town. Jeanne stepped in and finished her doses, let them out and fed them! On top of it all, she stays to give the puppies lovin’ and some much needed play time! She’s wonderful with our tiny dogs, and they love her! Thank you Jeanne! When my family and I are at work or school, we can always count on Jeanne from A+ Pet Sitting, to take care of my dog, Carmi. Jeanne has taken care of Carmi on several occasions and has provided many different kinds of services for her. She drives to my home to take Carmi out to go to the bathroom, takes her for walks and makes sure she has food and water in her dishes before she leaves. The most important thing I have found is that Carmi seems happier that she has a “friend” who visits her once in awhile. I’m happy I’ve found a responsible pet lover to care for my pet when I am away. Thank you Jeanne and A+ Pet Sitting for providing a loving and wonderful service! My name is Jeanne Cairns, and I am the owner and general manager of A+ Pet Sitting. What sets Madison Wisconsin‘s A+ Pet Sitting apart from other services is the personalized attention I give to my clients pets. I don’t just go through the motions of dog walking or a house-sitting experience. I am very aware that your relationship with your pet is an enriching one. 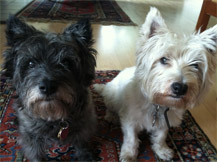 A+ Pet Sitting, Madison Wisconsin’s Leading Pet Sitting and Dog Walking Service. Serving: Madison WI, Middleton WI, Fitchburg WI, Monona WI, Sun Prairie WI, McFarland WI, Waunakee WI, Cottage Grove WI and Oregon WI.